Norther offshore wind farm will be developed in the Belgian North Sea, approximately 23km off the coast of Zeebrugge. Image courtesy of Mitsubishi Corporation. MHI Vestas Offshore Wind will supply the wind turbines for the Norther offshore wind farm. Image courtesy of MHI Vestas Offshore Wind. Van Oord proposes to use its Aeolus and Nexus vessels for installing the monopile foundations and wind turbines at the Norther wind farm. Image courtesy of Van Oord. The Norther offshore wind farm is a 370MW project to be built approximately 23km off the Belgian coast, alongside the border with the Netherlands. Situated within the Exclusive Economic Zone of Belgium, Norther is expected to be the biggest offshore wind farm in Belgium, when completed. Renewable energy producer and Nethys subsidiary Elicio holds a 50% stake in the project, while Netherlands-based Eneco and Diamond Generating Europe, a UK-based subsidiary of Mitsubishi Corporation, each hold a 25% stake. Offshore construction works on the project are expected to start in mid-2018, while operations are expected to begin in 2019. The wind farm is expected to generate 1,394GWh a year of renewable energy, on an average, that will be sufficient to supply for approximately 400,000 households. Its development is expected to require a £1.2bn ($1.3bn) investment, and will create 1,400 full-time equivalent (FTE) direct jobs and an additional 1,400 FTE indirect jobs. The Norther offshore wind farm will be spread over 44km² in water depth between 16m and 33m. The project will feature 44 MHI Vestas 8MW wind turbines, which are capable of delivering maximum output of 8.4MW. 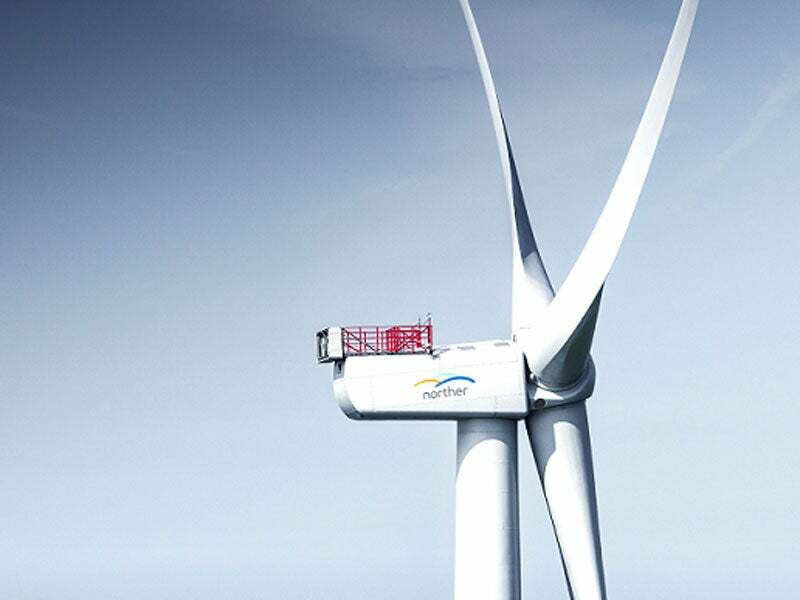 Each turbine has a rotor diameter of 164m and a swept area of 21,124m². The 33kV electrical energy generated by the turbine generators will be transported to an offshore high-voltage station (OHVS) to be built south-west of the geographical centre of the wind farm. The electrical energy will be converted into 220kV for export to the grid via a single export cable. "Offshore construction works on the project are expected to start in mid-2018, while operations are expected to begin in 2019." The wind turbine generators will be connected to the OHVS by approximately 70km of 33kV aluminium AC subsea inter-array cables. Each cable will be made up of three power cores and an optical fibre unit for communication and control purpose. The stepped-up electricity will be transported to the Beach Pit through a single 26km-long, 220kV AC submarine export cable, and further to the grid through an onshore cable. ENGIE Electrabel and Eneco will market the electricity produced by the wind farm. Financial closure for the Belgian offshore wind project was achieved in December 2016. A consortium of ten financial institutions agreed to provide a non-recourse debt of €900m (approximately $972m) for the project. The debt includes a €438m ($473m) loan by the European Investment Bank (EIB), half of which is guaranteed under the European Fund for Strategic Investments (EFSI). The remaining financing will be provided by a commercial lending club comprising a consortium of a group of European and Japanese banks, which includes ABN Amro, Belfius, BNP Paribas Fortis, Rabobank, Société Générale, BTMU, SMBC, and SMTB. Green Giraffe was the financial adviser, while Loyens & Loeff acted as the legal adviser for the financing deal. Mott MacDonald was the lenders technical adviser (LTA) during the financial closure of the project. The company will also provide construction and operational monitoring services. MHI Vestas Offshore Wind was awarded the contract for the supply of 44 V164-8.4MW wind turbines for the Norther offshore wind project. Van Oord was contracted in December 2016 for the Balance of Plant works for the project. Its contractual scope includes the installation of wind turbine generator foundations, offshore high-voltage substation, inter-array and export cables, as well as turbines. COWI was engaged to conduct the tender design for monopiles and secondary steelworks. The design includes a monopile without a transition piece, driven directly on the interface flange to the turbine. Van Oord subcontracted MME Group for equipping the wind farm’s turbine generator foundations and the offshore high-voltage station with its impressed current cathodic protection (ICCP) system, which protects against corrosion. Sif Holding was subcontracted by Van Oord for the production of the monopiles and the OHVS pile. Belgian high-voltage transmission system operator Elia will connect the wind farm to the country’s power grid. Tractebel provided assistance in wind farm development, domain concession application file, follow-up of geotechnical site investigation, assistance during site investigations, and in conducting risk assessment studies for the project. Elmeridge Cable Services (ECS) provides specialist engineering solutions for the high voltage cable industry world-wide. Through our network of global manufacturing partners, we can provide a complete portfolio of polymeric and paper insulated cable systems, design, jointing, commissioning and testing to meet the customer's requirements.